I like all kinds of creative avenues! 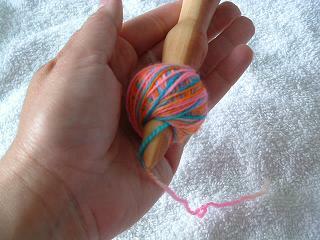 Yarn fun, like, Spinning, Dyeing Wool, Knitting, and Crochet are part my adventures. 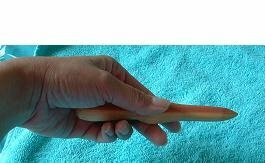 Woodworking also is in there, and my woodworking creations lend many hands to tools. 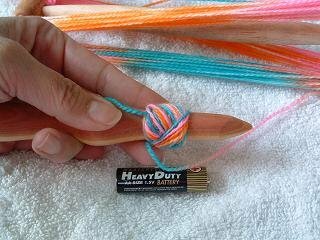 I thought that people might like to see how I use my tools with yarn. 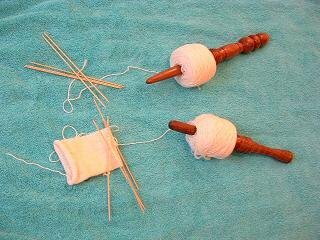 A Nostepinne is useful for winding a center pull ball, especially when the yarn/thread is thin or the total amount of yarn is not enough to make a ‘jumbo’ ball. 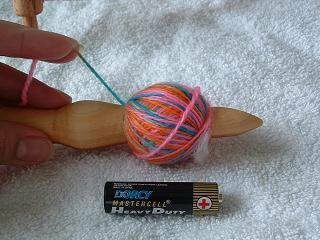 However, even an abundance of yarn can be hand wound, if necessary, and with a Nostepinne, the job is much easier than using no ‘core’ or center to keep the middle section open for the ‘pull center’ to freely flow from the yarn ball. 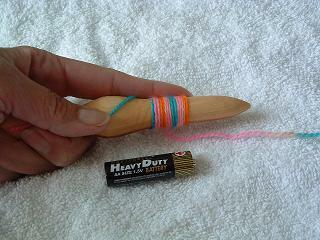 Here I am using my ‘mini Nostie’ to wind a mini handpainted yarn skein for a mini sock. Hold the Nostie, working end out. 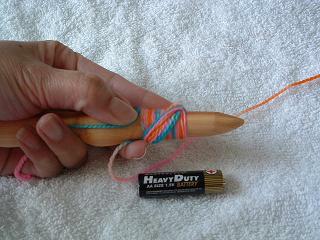 Hold the end with thumb, this will be the center pull start so do NOT lose this strand. It is important to keep hold on this end. I have lots of slack beyond my thumb, to ensure that this end does not get lost. Wrap around the end of the Nostie for an inch or two. 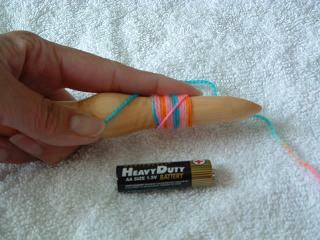 This is a mini Nostie making a mini ball, so I wound it just about an inch. 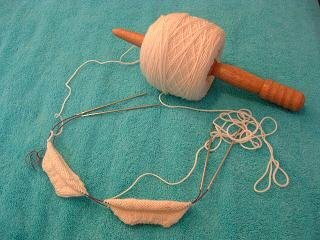 To start the crosswise winding, wrap the yarn up to the top right of the straight wraps, bring the yarn around the Nostie and back to the lower left of the straight wrap. This makes a diagonal line across the straight wrap. Continue to wrap the diagonals, while turning the Nostepinne around so the the next diagonal sits on the top of the previous diagonal. Continue those diagonal wraps as the Nostepinne turns to let the next wrap rest above the previous one. Voila! The ball is done. All the yarn is wrapped. There is the ‘center pull ball’. However, the ‘pullable’ side is facing the handle, and I want it to face off the ‘end’ of the Nostepinne. So, I slip it off the end and turn the ball around, then slide it back onto the point of the Nostepinne. Here it is, turned around so that the ‘pullable’ side is facing the end of the Nostie, ready for that side to get on the needles or hook. Here is the center pull ball, parked, ready to use! I’m knitting a pair of Kilt Hose for my son. 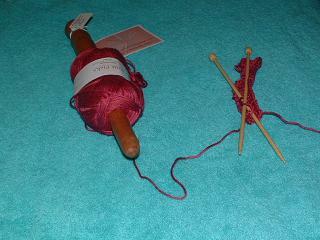 I’ve got 2 socks on 2 circulars, the ball of wool is a natural color, and I’m working it from both ends of the ball. The ball is parked on the Nostie the center pull yarn is attached to one sock, the other yarn that unwinds from the exterior of the ball, is attached to the other sock. 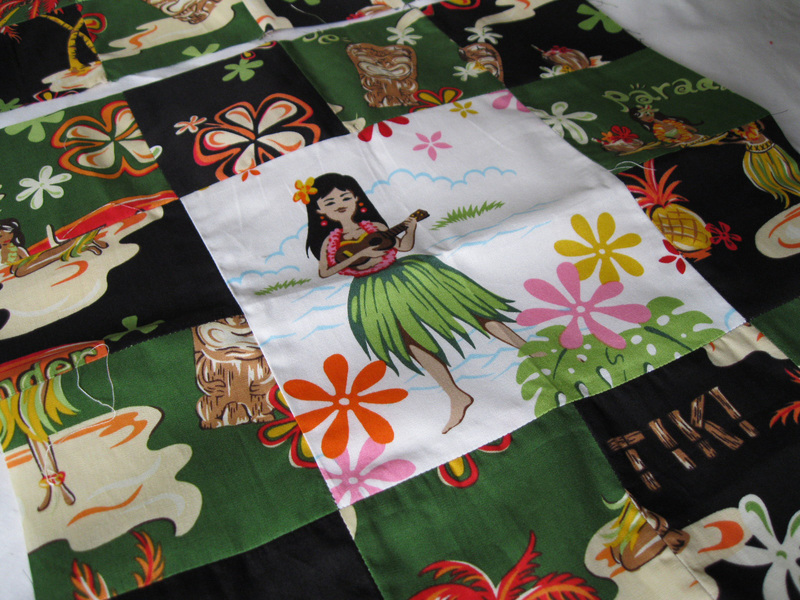 When it is time to ‘flip’ the needles, I simply ‘flip’ the Nostie…the yarn never tangles. 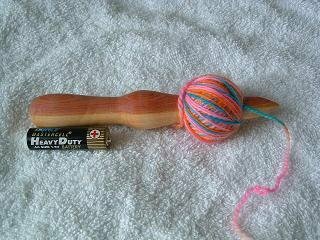 Here, I have set up 2 balls of yarn, each on its own Nostie. I am currently working a swatch on the one shown here. To work 2 socks from 2 different balls of yarn, park each ball on their own Nostie. 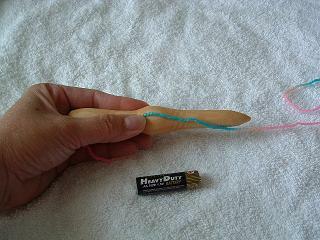 The center pull is attached to the knitting work. I was swatching with the needles, so I had them detached already from the work, but you can see that the pull center is coming off the working end of the Nostie, going to the needles and the project. With all of these, when I need to clean up or put any of this away, I simply lift the Nosties and the project and place them all in a project bag. The yarn never tangles or collapses in on itself. The projects are kept neat and simple. 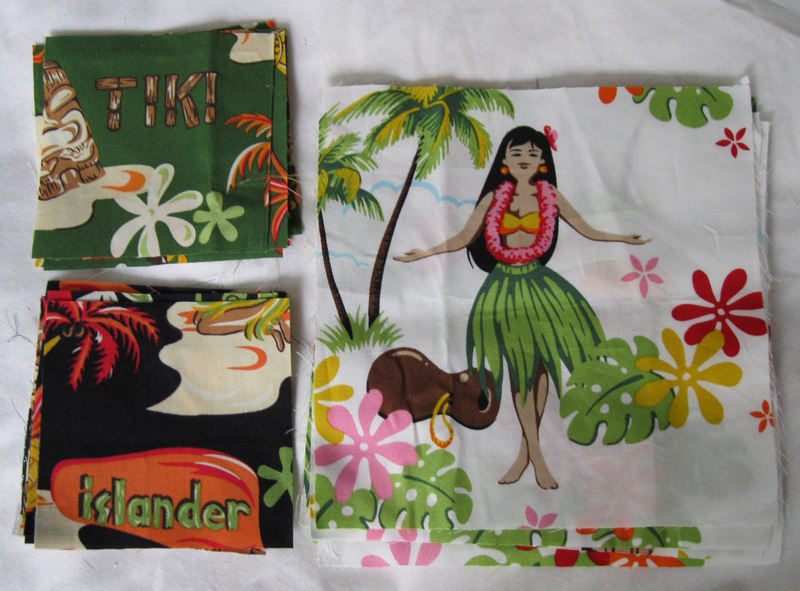 What do you get if you mix these fabrics together? 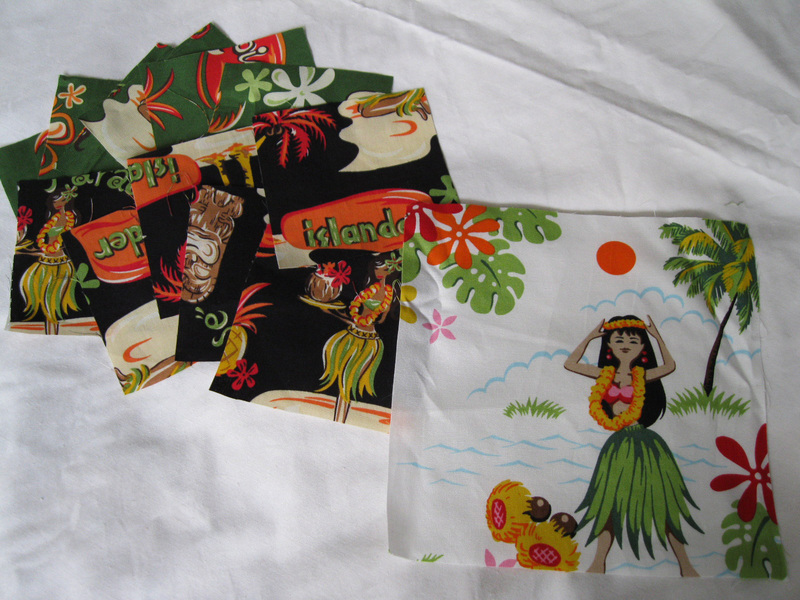 How about if you cut them up into little 6.5″ and 3.5″ squares? 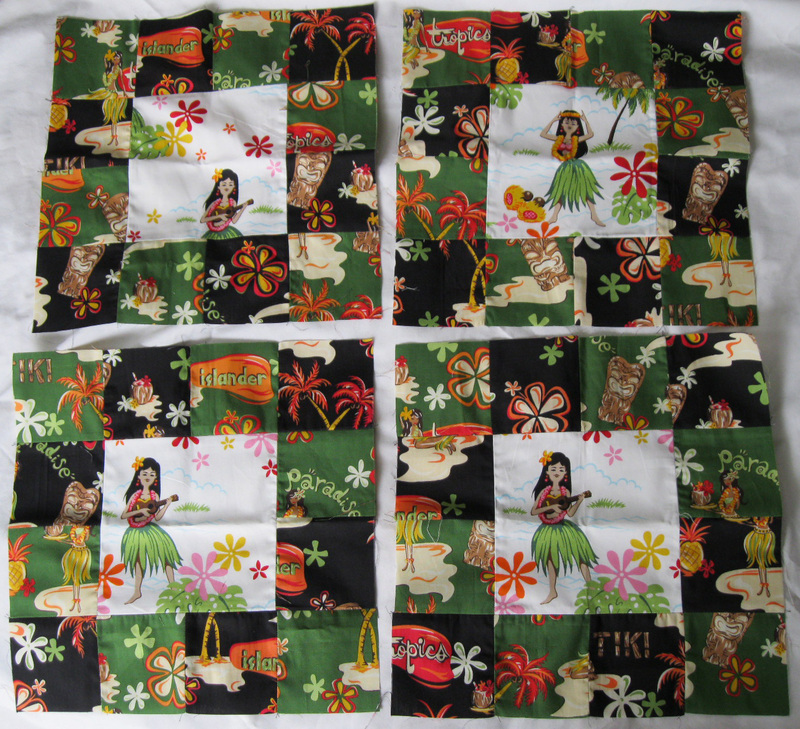 Now, what to do with the 12×12 squares…what could they become? 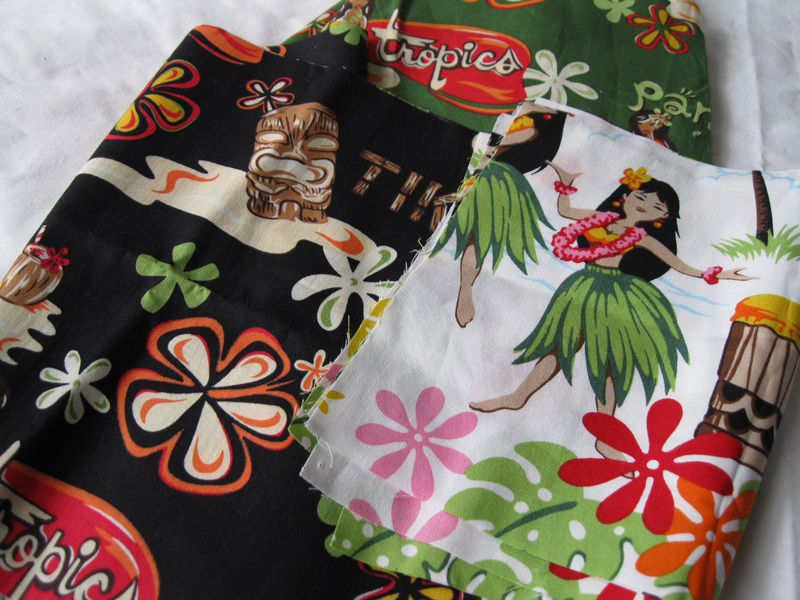 What if the big squares are mixed with a few other bright fun fabrics?